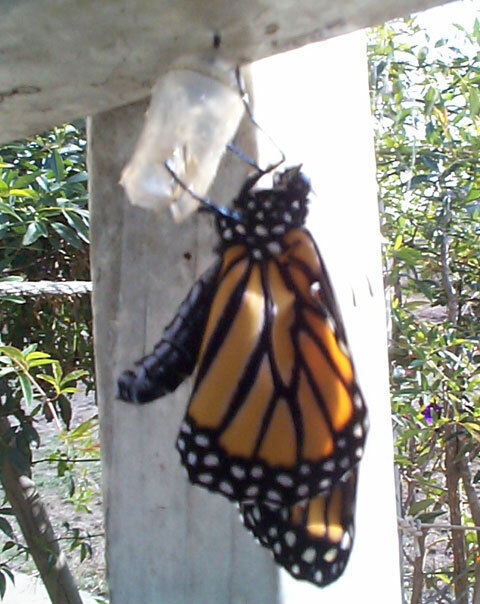 Want to take a Monarch Butterfly quiz? This is somewhat difficult. Two can play at the same time: OK, Bring it on! 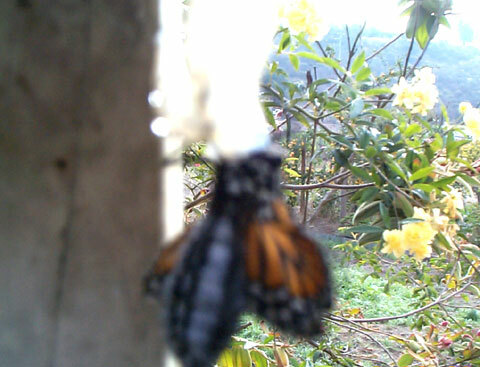 HI KIDS, MY NAME IS, DOUGLAS, THE BUTTERFLY. I'M A BOY. YOU CAN TELL BY THE SPOT ON EACH OF MY WINGS. Once upon a time, there was a butterfly. That BUTTERFLY'S name was NICKIE. When she migrated, she would stay at a lady's and man's house. Their names were Sandi and Pete. In the winter she would go back to Mexico. With her family and friends, Sandi and Pete always knew she would come back when her migration was over in Mexico. Every year she got bigger and bigger. 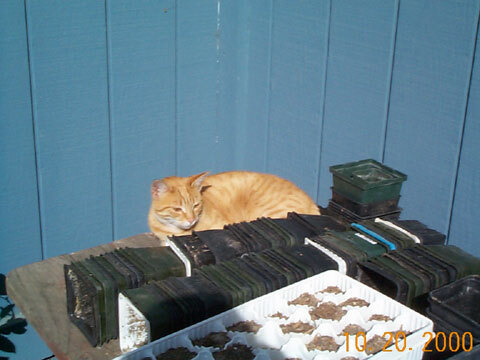 They always loved butterflies so they started to plant butterfly plants, so Nickie and her family and friends can eat. Sandi and Pete came up with a good idea--sell plants on the Internet. Their web site is www.butterflyplants.com. Come and see Nickie. One day there was a caterpillar. The caterpillar ate a lot. One day a kid found this caterpillar. He named it Chapulin. Chris took good care of the caterpillar. 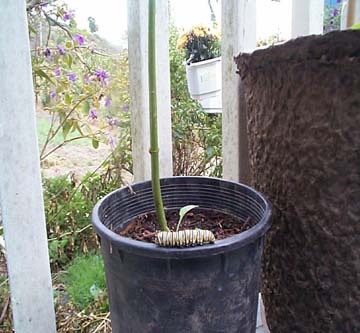 He put the caterpillar in a box with a plant called milkweed. 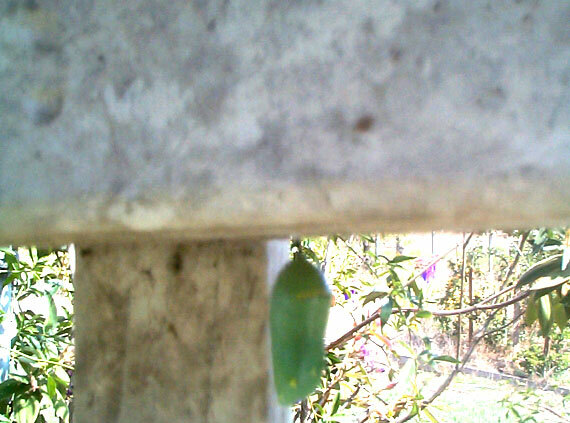 The caterpillar, Chapulin, kept eating and eating until he was so chubby, he could barely walk. One day Chris had to go somewhere. That same day the box that Chapulin was in had a hole. 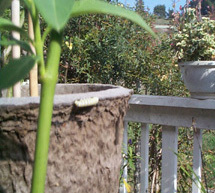 When Chris got home, the caterpillar was gone. Chris knew when caterpillars get really fat they start to make their chrysalis. So Chris looked in his small tree in his front yard. 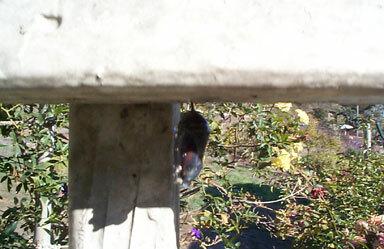 Chris found Chapulin was stringing his cocoon. He was so amazed. Chris would check his tree every day. 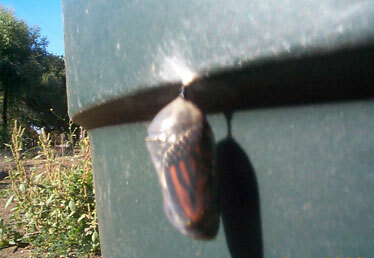 A week later Chris saw Chapulin finally coming out of its chrysalis. Chris said it was so beautiful!!! The colors of it were red, blue and white. Some colors were mixed like red and blue. He said it was the colors of the United States of America's flag. 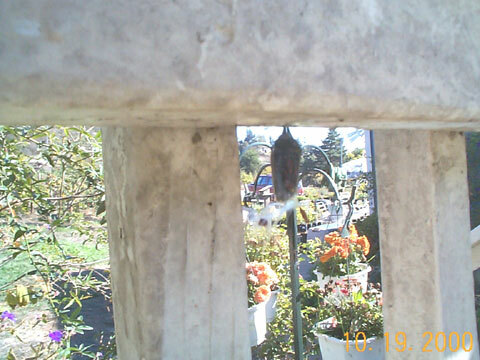 He took a picture of the butterfly. CHRIS SAID TO CHAPULIN, "HAVE A NICE TRIP WITH YOUR FAMILY". THEN CHRIS HAD ONE TEAR COME OUT OF HIS EYE. Send us your pictures, poems, and stories and we will publish it. Compositions can be sent via e-mail or snail mail. Pictures must be in .gif or .jpeg format if you e-mail. If you send pictures in hard copy format I might be able to scan them. Our fax does not work well with pictures but it is OK with letters, so your poems or stories could be faxed and we will scan or retype them. We cannot send any materials beck to you. 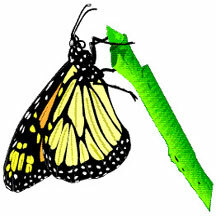 All items sent in become the property of Douglas-Michel Butterflyplants. If you send web-ready materials, there is a chance that it will be published sooner. If not, we will work with it to see how we can get it in. We will not publish your last name if you do not want it. Depending on space we will limit the number of submissions. Remember, the whole idea here is FUN!!!! Hi kids, we are now going to learn something about butterflies. My name is Wheezer. I am a caterpillar. It is now time for me to go to the next step in my development. That fence over there looks like a good place. Can you name what I will become? Well not there yet. A bit closer. Got to go around this pot and head for that fence! Well I made it!! This is a nice fence. I like it. Well protected and now I am all wrapped up and comfy. CAN YOU GUESS WHAT THIS STAGE IN MY LIFE IS CALLED? IT STARTS WITH A "C"! Take the quiz below. DID YOU GET IT RIGHT? SEE THE BOTTOM OF PAGE FOR THE CORRECT ANSWER. It's been 12 days. I am now getting ready to emerge. Here is a picture of my cousin. He found a garbage can down in the field and roosted there. 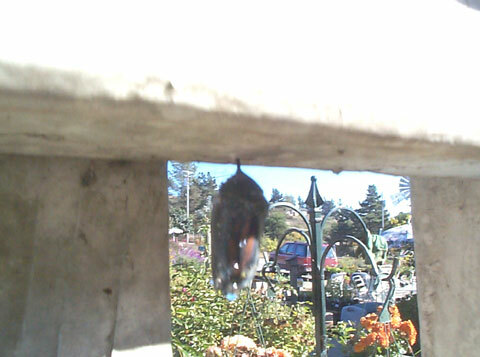 It looks like he is getting ready to emerge. Well it's almost time for me. When I come out, I'm kind of crinkly because I've been bundled up-something like one of those jackets that comes out of a bag. Now I have to get my wings full of fluids!! Now I am feeling a lot better, and I am getting ready to fly away!! I don't like the way that Marmalade is looking at me!! 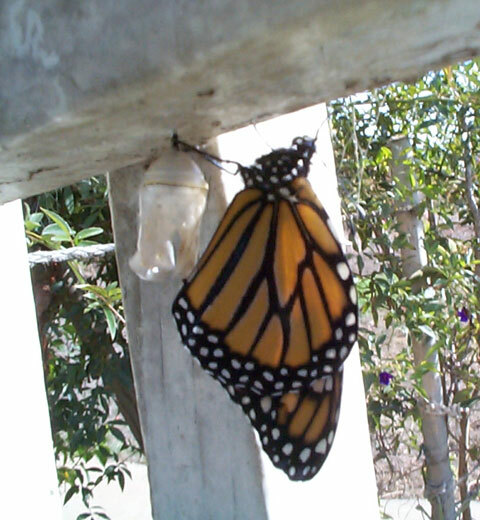 A caterpillar becomes a chrysalis. 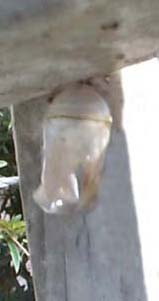 A moth on the other hand becomes a cocoon.